Join ASU students and local visual artists on Friday, November 4 at 7 p.m. for the Launch of the ASU DPC/Lawn Gnome Poetry + Public Art Project event. The event takes place at Lawn Gnome Books (905 N 5th St, Phoenix, AZ). Eight undergraduate poets on the DPC (under the direction of Rosemarie Dombrowski) produced poems under 25 words inspired by the city, its the desert ecology, and the people who inhabit it. The students will read for ten minutes of any literary work of their choice. Local artists then came together (under the organization of Aaron Johnson) to produce corresponding artwork. Both the poems and the artwork will be painted onto eight 8’x4’ boards that will be installed at Lawn Gnome Books and unveiled on the First Friday. The eight ASU Downtown campus poets are Megan Atencia, Sawyer Elms, Daniela Diaz, Anna Florez, Mandy Peterson, Richard Sais, Matthew Session, and Kellen Shover. The reading will be followed by a Q & A with the poets and artists. The event is free and open to the public. For more information, please visit the Facebook event. Inspired by the literary and philosophical salons of 17th century France, Four Chambers presents Get Lit: a night of conversation, community with ASU Lecturer of English Rosemarie Dombrowski, PhD. Are communities of physical and cognitive difference defined through different forms of literature? Does literature articulate a medical narrative differently from history or reports? Is literature important in the healing / therapeutic process? Rosemarie Dombrowski holds degrees in Anthropology and English as well as a PhD in American Literature. She has been a Lecturer of English on the Downtown Phoenix campus since 2008. She is the co-founder and host of the Phoenix Poetry Series, an editor for Four Chambers Press, and a member of the We Are Downtown project, all of which strive to integrate the myriad cultures and artistic endeavors of the Downtown community. She has also been the editor-in-chief of the undergraduate writing journal, Write On, Downtown, since its inception in 2007. Her teaching interests include women’s literature and the broaching of socio-sexual taboos, poetic confession, poetic rebellion, and Lady Gaga and identity/otherness theory. Her broader research interests include fashion ethnography, art history, queer theory, and the influences of Puritan literature and theology on everything from the Confessional School to pop culture. Rosemarie recently wrote an article entitled “Academia vs. Poetry: How the Gatekeepers of Contemporary Literature Might be Killing It” that was published at the Review Review. She is also the author of a collection of poems entitled The Book of Emergencies (Five Oaks Press). 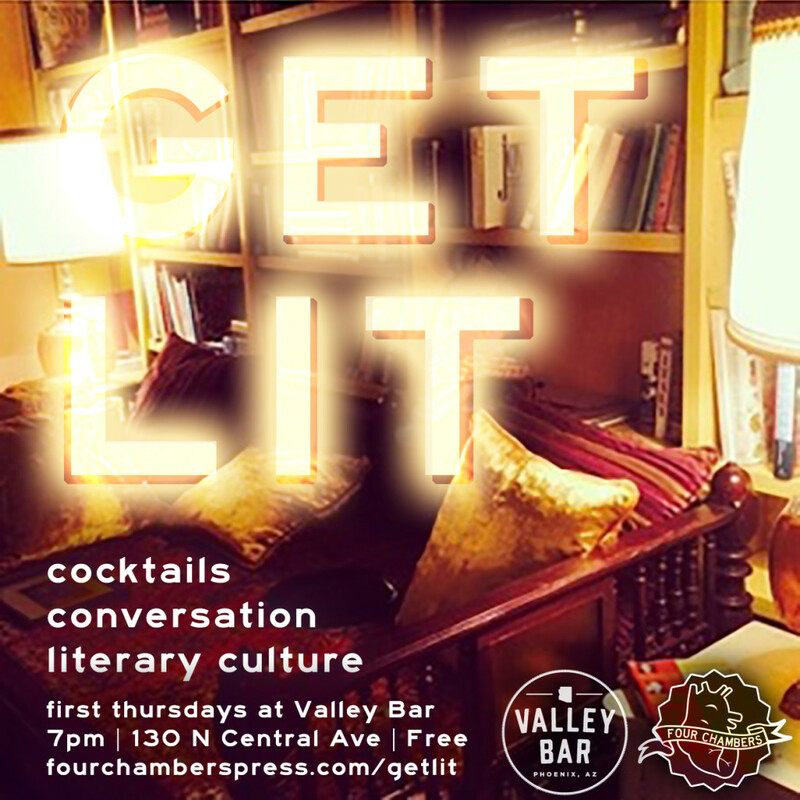 Get Lit is at 7pm every first Thursday in the Reading Room at Valley Bar (Basement, 130 North Central Avenue, Phoenix, AZ 85004). Valley Bar is located between 1st Ave and Central on the south side of Monroe. The Reading Room is located in the back of the Rose Room. While public parking is available on surrounding side streets, we recommend riding a bike or taking the light rail. Please note this event is 21+ over. For more information, e-mail fourchamberspress [at] gmail [dot] com. Four Chambers – an in dependent community literary magazine and small press based in Phoenix, Arizona – has released their latest volume, Welcome Home, a special collection of poetry and prose inspired by Welcome Diner, Welcome Chicken + Donuts, and the sense of community and belonging they bring to downtown Phoenix. The collection features 12 poems and 8 prose works from 20 local authors including Rosemarie Dombrowski, Kelly Nelson, Jenn Robinson, Daniel Mills, Ashley Naftule, Michelle Iwen, Marcus Christensen and Julia Fournier. The work itself covers a broad spectrum of traditional and contemporary styes, ranging from memoir and personal essay to found poetry, pastiche, speculative flash fiction, and experimental prose. Cover art was produced by Isaac Caruso. To celebrate, Four Chambers will be hosting a live reading and party Saturday, October 3rd at Welcome Diner (924 E Roosevelt St, Phoenix, AZ 85006) at 6:30 pm. Four Chambers will also be holding a more intimate event on the morning of Sunday, November 15th, 2015 at the Garfield Garden (1022 E Garfield St, Phoenix, AZ 85006). More information can be found on the magazine’s website at http://fourchamberspress.com. Welcome Home is the second volume in Four Chambers Presents, a special project series focusing on creative placemaking and public art in downtown Phoenix that aims to brings local writers together to produce thematic, site-specific work in partnership with local businesses and cultural institutions. The first volume, Poetry and Prose for the Phoenix Art Museum, was released earlier this year in March 2015. Future volumes may feature alcohol, pop culture, nature, or other topics to be determined.